While my hubby and kids love all types of pasta I am a fan of potatoes. I love mashed potatoes, baked potatoes and of course fried potatoes. Since I am the only one that craves potatoes I don’t make them too often. But, when I do I want to make sure everyone will eat them. I figured out a while ago that in order to get my hubby to eat potatoes I needed to make them for breakfast. Why breakfast instead of dinner I still have not figured that one out yet. Hey, I don’t mind as long as I can eat potatoes. I first flirted with making a turkey hash but put that recipe aside because I did not have turkey at the time I decided to create a breakfast potato recipe. I did however have a package of diced ham I was going to use in a ham salad recipe. Preparing Ham Hash was a nice choice mostly because I had all the ingredients on hand. A lot of recipes are created based on what is in the pantry or refrigerator when chefs put on their creativity caps. At least, that is how quite a few of my recipes are pulled together. Using a little bit of this and that based on what you have to work with is a great way to create new tasty meals. I am never afraid to try something new and fortunately my family does not mind participating as my taste testers in my crazy kitchen laboratory. 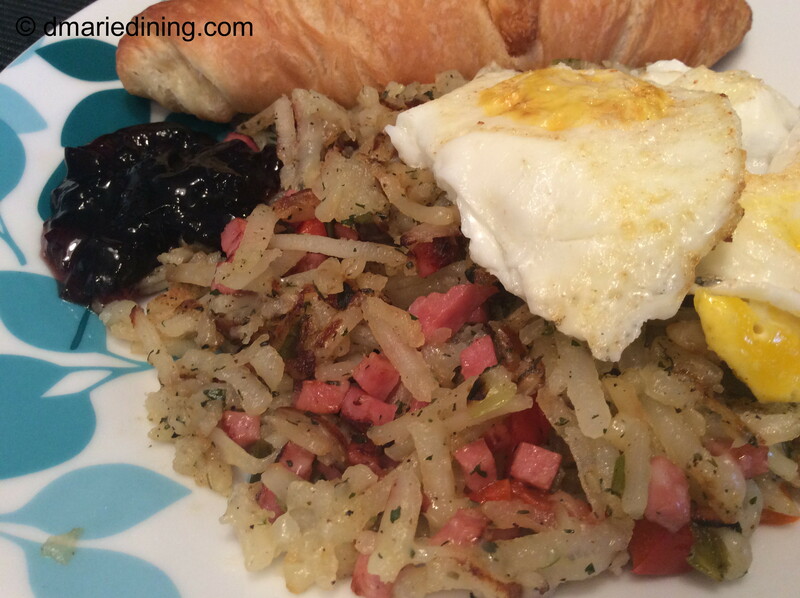 Creating a Ham Hash recipe was not a big stretch. This is a very simple recipe that is full of flavor. One of the best things about the recipe is that it is quick to fix. The potatoes and veggies do not take long to cook especially since I used packaged shredded potatoes (I do shred my own Yukon Gold potatoes when I have time). Plus, the ham was already cooked. So…. Viola! Quick and Easy. Heat bacon fat in a large skillet over medium heat. 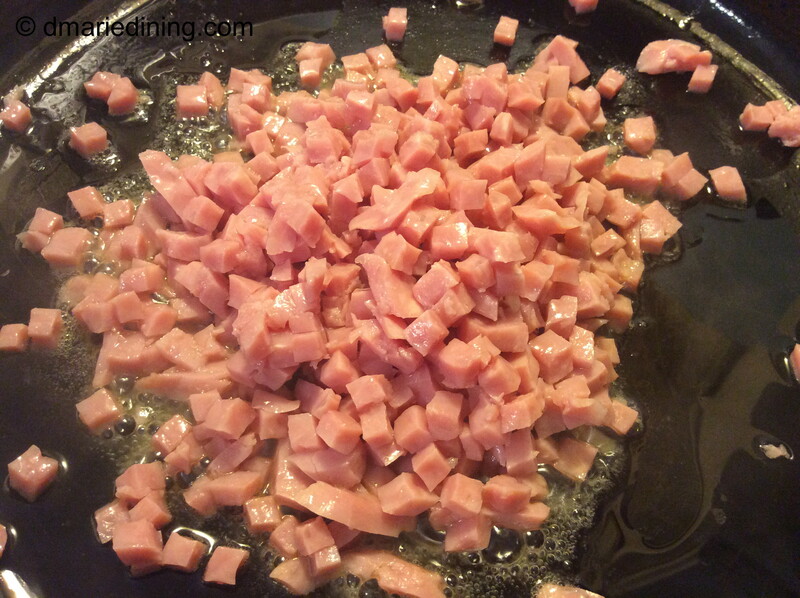 Add diced ham and stir to coat with fat. Cook until ham is slightly browned. Remove from skillet and set aside. 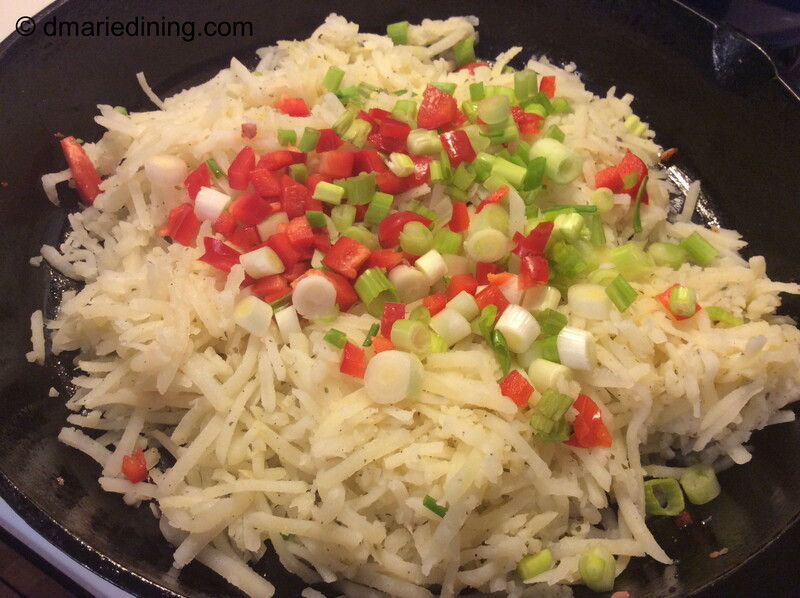 Add potatoes and veggies to the skillet and sprinkle with seasonings. Stir to mix veggies with potatoes. 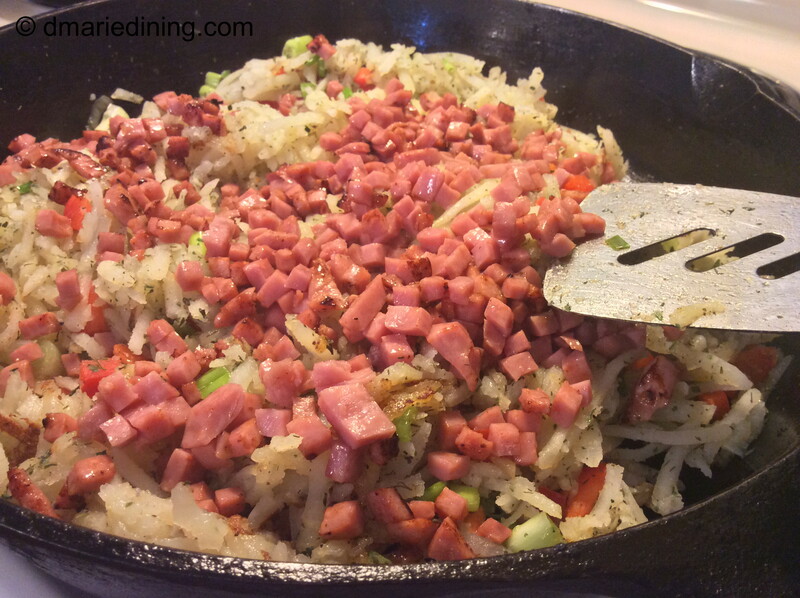 Increase heat to medium high and allow potatoes to crisp up a little for 5 – 6 minutes then add ham back to the skillet. Reduce heat to medium. 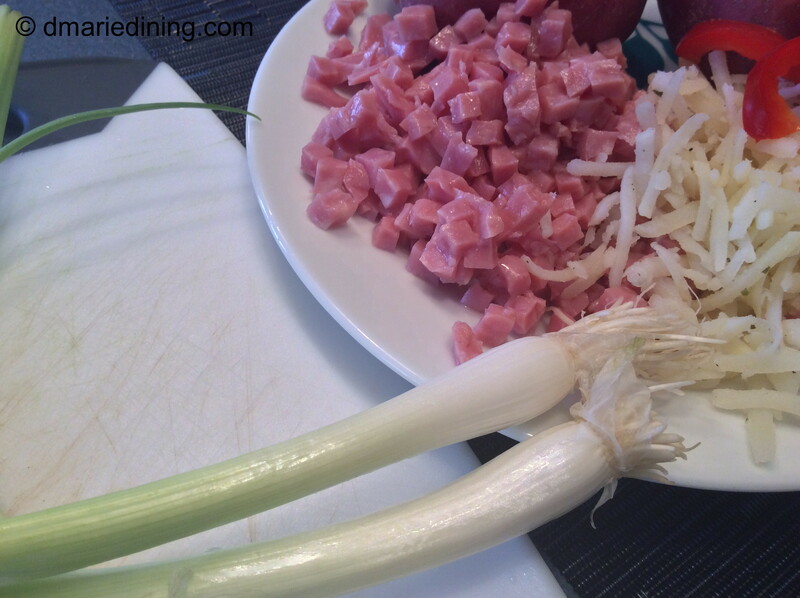 Stir to mix in ham with the potatoes. Cook an additional 8 – 10 minutes stirring occasionally until the potatoes are cooked through. Serve with eggs and biscuits. Weekends are usually the only time I have to make a family breakfast. But, even on the weekends I may be crunched for time to get breakfast on the table. Between basketball games, errands or family outings I sometimes have to pull together a quick meal before we head out the door. 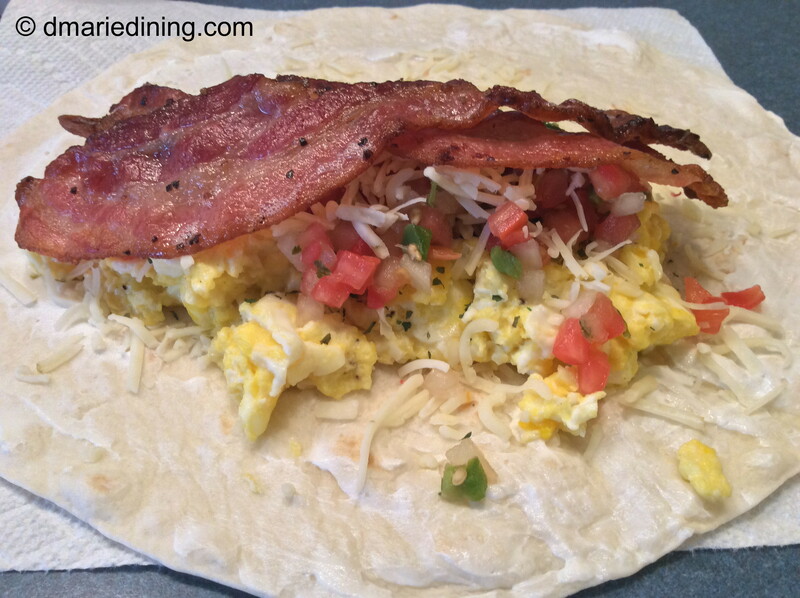 Breakfast Burritos are a quick way to get a relatively balanced breakfast on the table without a lot of fuss. 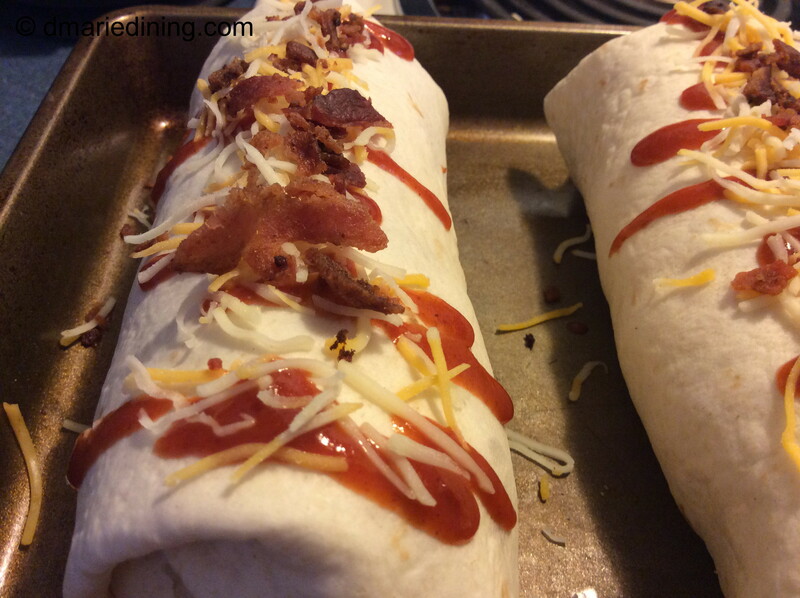 Plus, the burritos are light but filling so you feel satisfied and not hungry a few minutes after eating. I like to add veggies to my Breakfast Burritos to make them seem healthier than if I loaded them with potatoes or other heavy foods like you see in fast food commercials. That being said, it doesn’t mean I don’t like a little bacon on my burrito. Healthy is good but bacon is too! Getting back to the veggies in the Breakfast Burrito, I count salsa as a veggie. Salsa is basically nothing but veggies. Tomatoes, onions, peppers. Three vegetables in one scoop of salsa. How great is that? Even my youngest son likes salsa. Although he would also tell you he does not like fresh tomatoes. Cooked? Yes. Fresh? No. Crazy I know but it is all a mind game. There are plenty of things in life folks say they don’t like in one form but love them in another form. For instance, I have a friend that refuses to each raw broccoli with dip. However, she is wild about broccoli salad. Go figure. Hmmm… it must be the bacon. Again, bacon is always good. Yea bacon! Okay, I got off track for a second. Back to the Breakfast Burritos. You can add whatever you like to your burrito. Leftovers are a wonderful filling to Breakfast Burritos as long as they go with eggs. 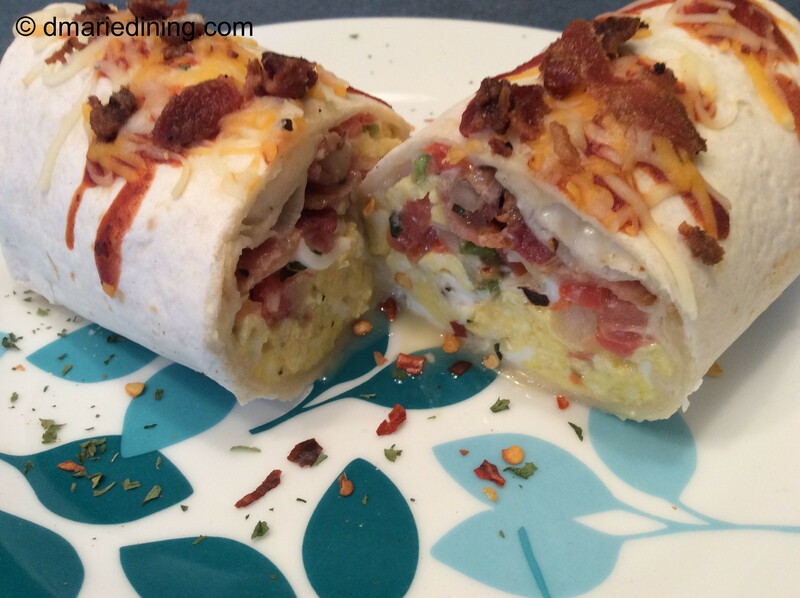 Try my standard version of a Breakfast Burrito then try creating your own version. Whatever you do I know it will be good. 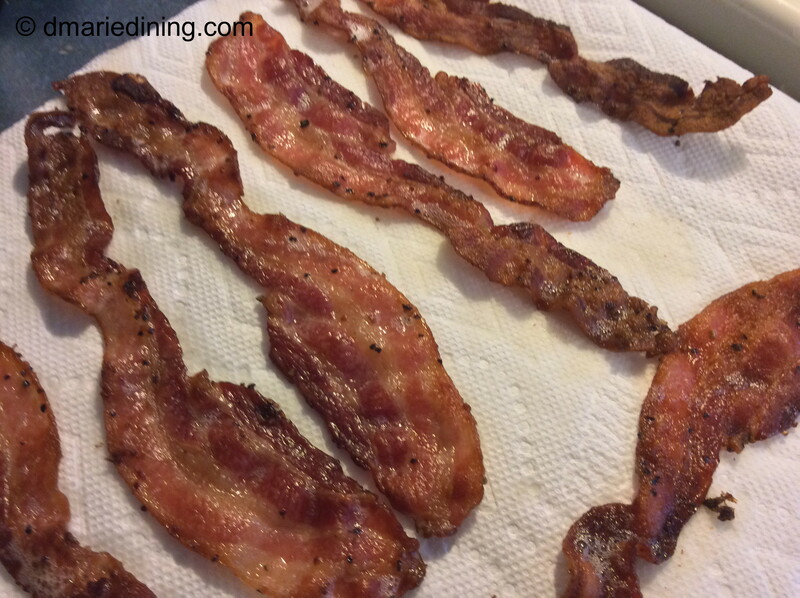 Place bacon on a microwave safe plate with a stack of 3 paper towels and cover with a paper towel. Microwave bacon for 4 ½ minutes until crispy. May need to adjust time based on your microwave. Set aside. Melt butter in a medium size non-stick frying pan. Add eggs and milk. Break up yolks in the pan and stir until eggs are blended with the milk. Stir in cheddar cheese and black pepper. Cook until eggs are scramble, light and fluffy. Lay a large tortilla on a flat surface. Spread a little cream cheese over the tortilla. This will act as a binding agent to keep the tortilla together when you roll it up. 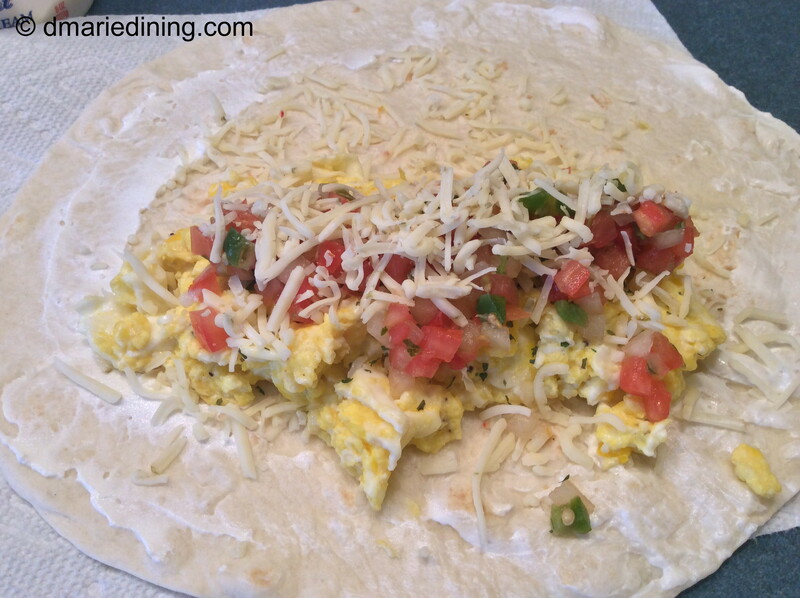 Place a spoonful of scrambled eggs at one end of the tortilla. Layer a little salsa over the egg then sprinkle shredded Colby Jack cheese over the salsa. Add two slices of bacon over the cheese. Fold the closest end of the tortilla over the filling then fold in the two sides. Roll the tortilla tucking in the sides as you go until you reach the other end of the tortilla. Place tortilla on a cookie sheet sprayed with cooking spray. Repeat with remaining tortillas. Bake the tortillas for 5 – 10 minutes to allow cheese to melt and the tortilla is warm. 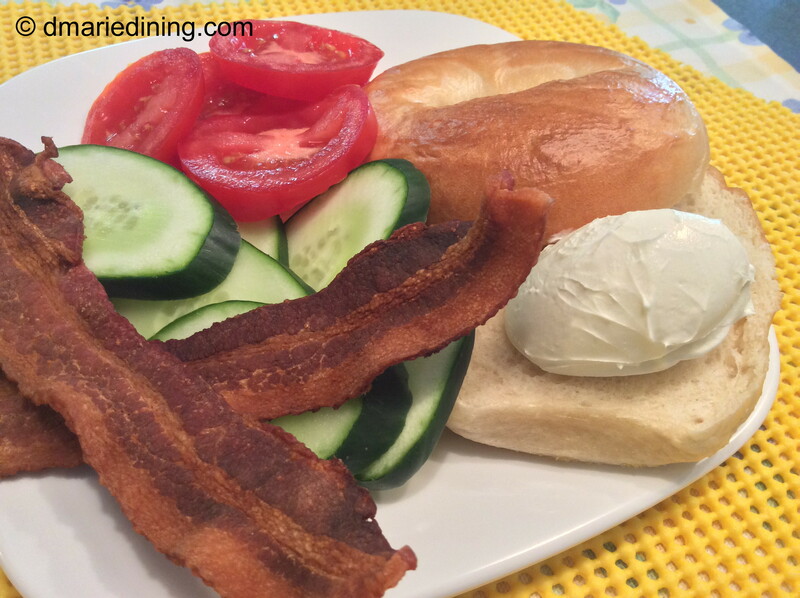 BCT (Bacon, Cucumber and Tomato) sandwiches are a nice little treat for breakfast, lunch or dinner. Instead of a heavy load of bacon, eggs, potatoes and pancakes, a light but filling sandwich is the way I like to roll. Nothing against a big breakfast but after eating that much food I am ready for a very long nap. 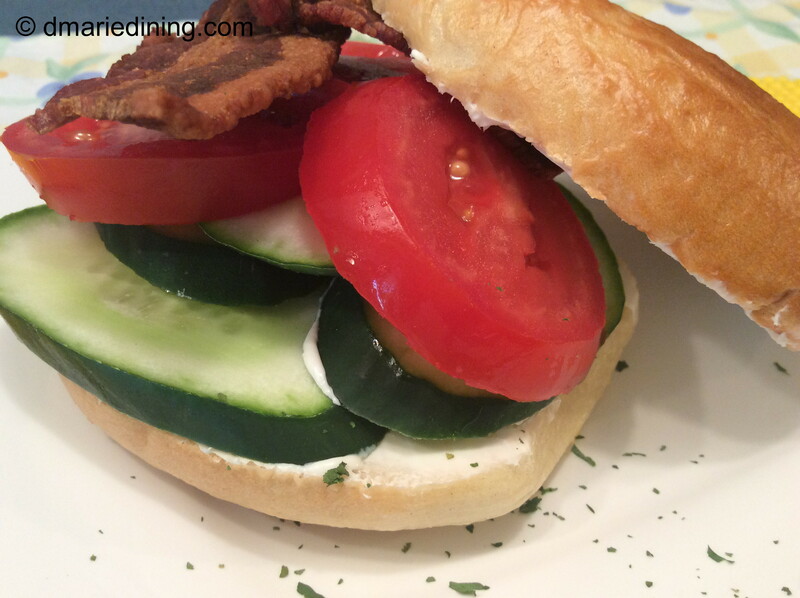 A take on the classic BLT, the BCT provides refreshing veggies and the smoky taste of bacon. I first experienced having a breakfast sandwich with BCT when my hubby brought one home from a trip to the gas station that also has a deli inside. It was on a particular Saturday which I deemed cereal day because I was not into making breakfast that day and no one else volunteered. Since hubby wasn’t in the mood for cereal he decided to pick up a breakfast sandwich when he went to get gas (he is such a good multi-tasker). I must say I was a little envious when he showed me his sandwich and I looked down at my soggy cereal. 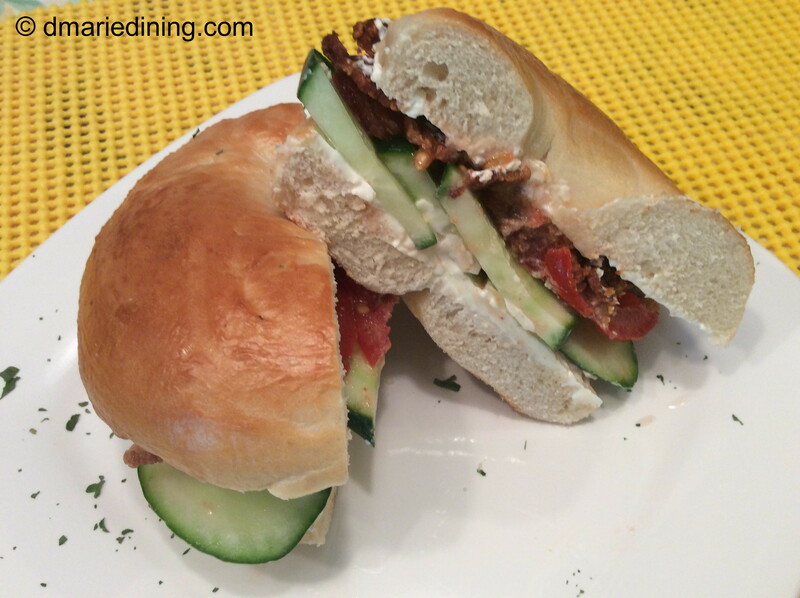 Needless to say, I decided I could re-create hubby’s Bacon, Cucumber and Tomato sandwich and turn it into a sandwich for breakfast, lunch or dinner. For breakfast and lunch the BCT is pretty straightforward. Although, to elevate the BCT as a lunch sandwich I sometimes add lettuce or fresh baby leaf spinach. For dinner, I will add a few thin slices of turkey breast or smoked salmon with capers. No matter when you decide to eat a BCT I know you will like it. Especially, if you are tired of cereal. Toast bagels. 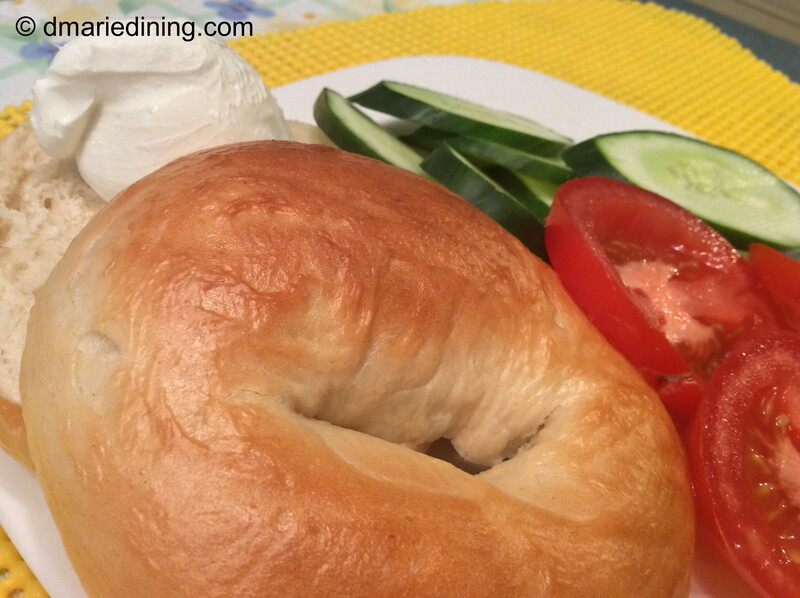 Spread both sides of bagel with cream cheese. 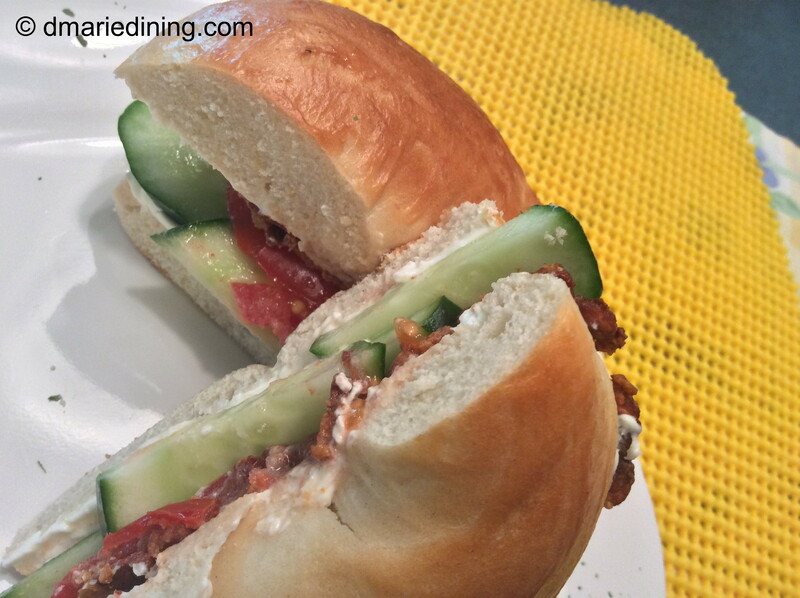 Layer one side of bagel with tomato, cucumber then top with bacon. For our first AAU game this season, I and another parent (C.T.) volunteered to provide snacks for the guys to have in between games. CT brought bananas, grapes and clementines while I supplied the Gatorade and granola bars. Although our intentions were good, we found out we could not bring food into the arena. Since it was a cold snowy day we could not organize the guys to go outside and partake of the goodies. Needless to say there was a lot of Gatorade and fruit leftover. CT suggested I keep the fruit and put it to good use so I left the games with a good helping of bananas. I thought about making some type of fruit salad but I ate quite a few grapes on our long journey home. My hubby ate most of the clementines which meant I only had bananas to worry about. 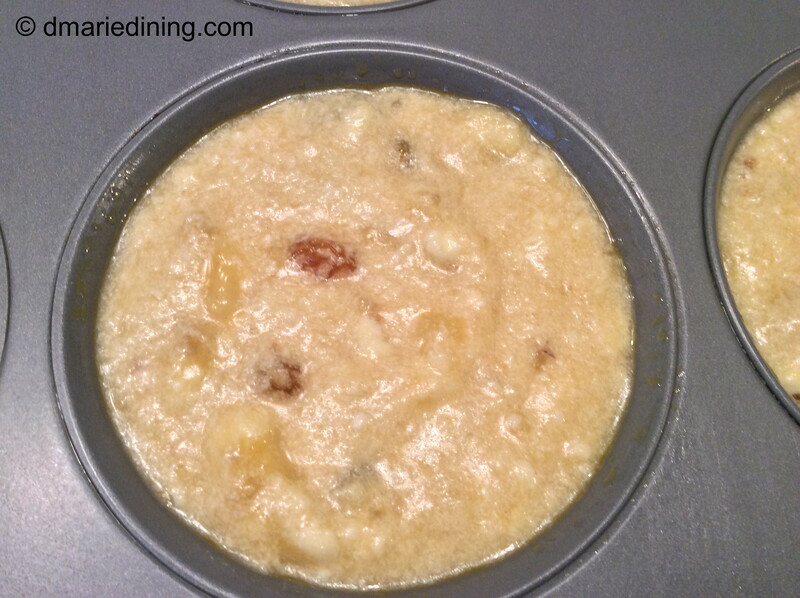 I wasn’t in the mood for banana pudding and wanted to make something I had never tried before. 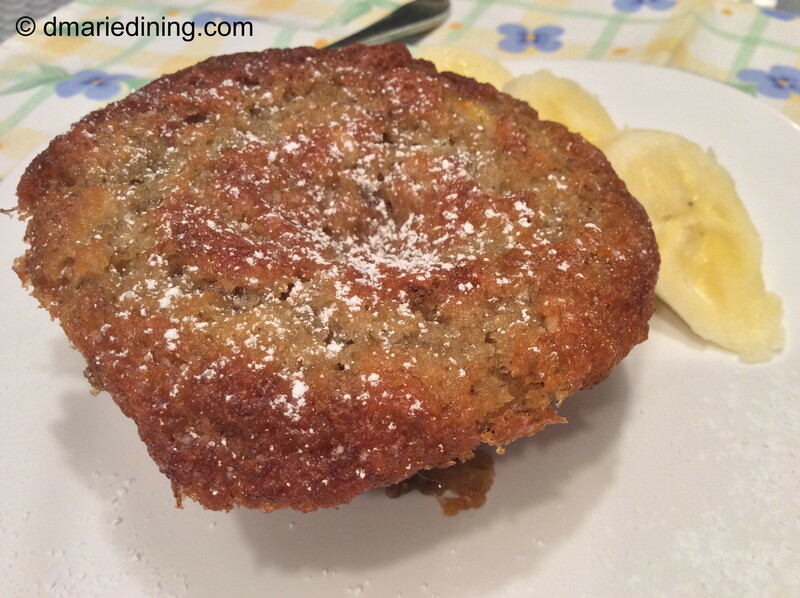 As you know, I am still working on my baking skills and thought I could try out a banana nut muffin recipe. 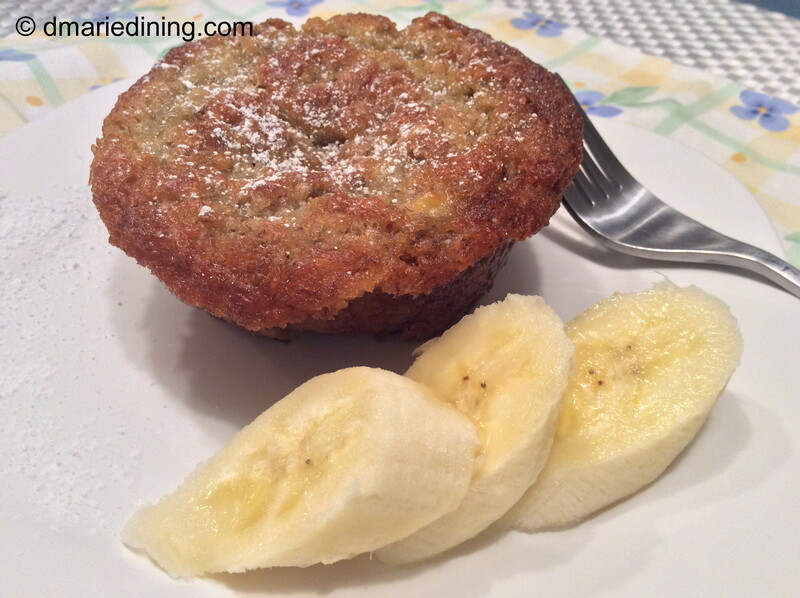 I found an old recipe in my recipe box for banana bread that I decided to turn into a muffin recipe. I just tweaked the banana bread recipe a little by adding golden raisins and nuts to the mix. Yummy… The muffins came out really moist and flavorful with a subtle crunch from the pecans. 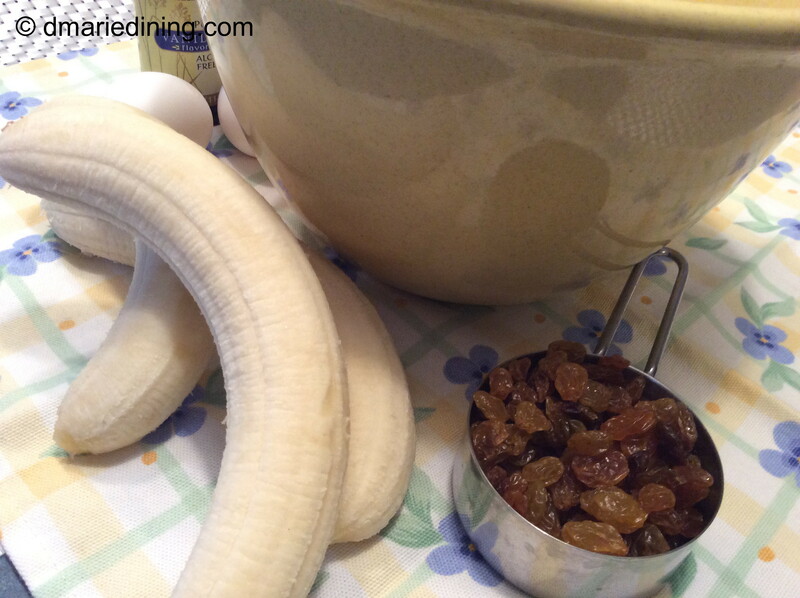 Plus, the golden raisins plumped up and added another layer of sweetness along with the ripe bananas. In the end, I was happy with my updated recipe and felt confident I could share this recipe. 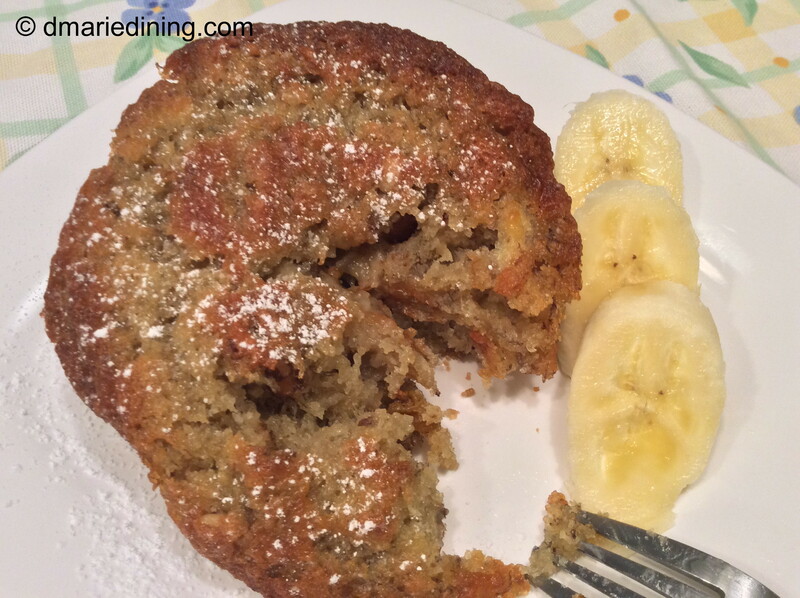 Thanks CT for providing the bananas and for helping me to stretch my baking wings once again to create a lovely banana nut muffin. Place all ingredients in a large mixing bowl. Spray muffin tin with cooking spray then fill each cup a little more than half way. Bake for 15 to 20 minutes until center is set. Place a tooth pick in the center of the muffin and if it comes out clean muffin should be done. If necessary, cook a few more minutes. Let rest for 5 minutes. Run a butter knife around the edge of the muffin to loosen then gently lift out of the muffin tin. Dust with powdered sugar.